Caz has always been a reader and still has most of her childhood books ready to pass onto her kids. She still reads in bed before she goes to sleep as a way to relax (even though some nights it only takes 2 lines till she is dead to the world). Each of her children also read in bed as a way of winding down from the day, their bedside tables usually have a large stack of books on them. Caz has used patterned paper blocks in calming shades of blue from the Basic Grey Oh Baby Boy range. Rub-on and Chipboard alphas by Lil Davis. Since moving to Mackay Marni and her husband spend quite a bit of time at the beach with their dogs. She has found that when they go down there all the troubles of the world disappear if only for a little while hence the title My Sweet Escape which she borrowed from a Gwen Stefani song. 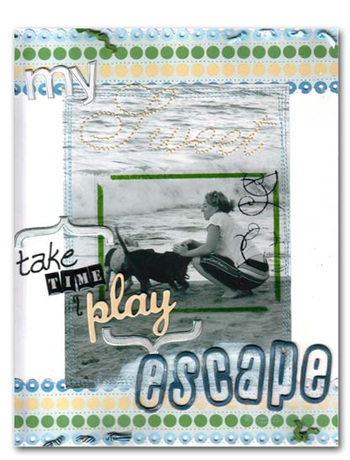 For this layout Marni cut two strips of Lil Davis patterned paper and used the circles to create a scalloped edge. Then to create interest she punched holes along the top and bottom rows and tied some ribbon through some of them. Marni also created her own acetate frame for the photo using Photoshop Elements and an inkjet transparency. Tamar was so excited to get this new toy! She had to do a layout about it - relaxation stuff is few and far between for her in her life so she was struggling to think of something that she could use. The cute apple sticker comes straight from the ipod pack! The photo was very white so Tamar wanted to do something different with the papers - she chose BasicGrey for accents and the Lil Davis for a funky background, and kept the chipboard white to match with the ipod advertising. 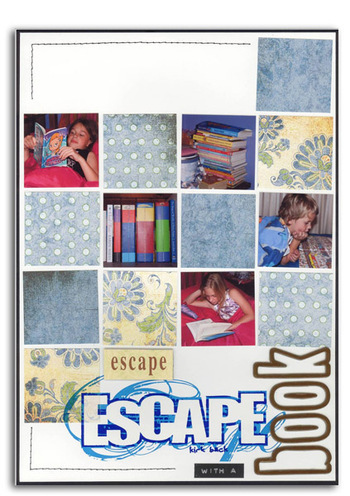 The journaling is printed straight onto photo paper. If Mel had to choose one time of the year that she finds the most relaxing, it would have to be Christmas time. She loves everything from putting up the Christmas tree, shopping for gifts and talking about how many sleeps to go until Santa Claus arrives. 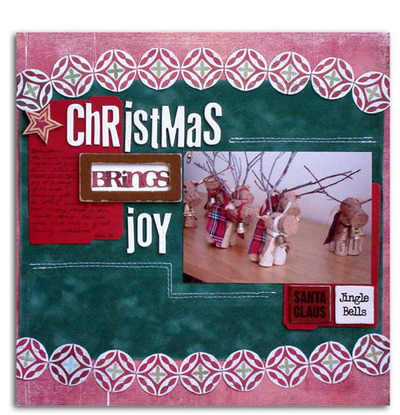 To celebrate this she used a single photo and combined Basic Grey patterned papers with SEI velvet paper and Lil Davis chipboard Christmas words. The Lil Davis file folders are also perfect to unfold and record journaling on. With this layout Rach wanted to record her motto, define her drivers and the qualities that are important to her. When she is achieving these things she is the most at home with herself, so decided to take this unique view of relaxing to give her album this important page. 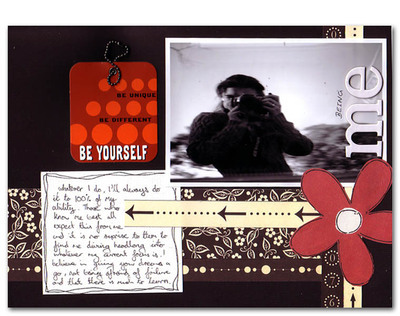 She kept the embellishments simple using a strong colour scheme of black, white, red and cream, and used elements such as the flower tag and title to frame her photo, but with the arrows of the paper to highlight her journaling as well. The photo is also unique, a self reflection taken in a tinted car window!